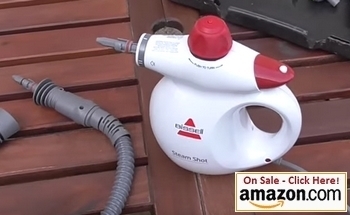 The Steam Shot Hand Held Steam Cleaner made by Bissell is the perfect steamer to deal with smaller cleaning jobs around the house when you don’t want to haul out the big machines. It is lightweight, heats up in super quick time and does a more than adequate job than what you would expect from such a small steamer. This is the perfect little steamer for when you need a steam cleaner but don’t want to spend loads of money or don’t want to deal with a big machine. Let’s start by taking a look at the features of Bissell’s Steam Shot before moving on to the Pro’s and Con’s of it. I’ve also added a few handy tips to help you make the best use of this nifty hand held steamer. The water tank holds 6.6 oz of water that will allow you to steam clean between 15 to 25 minutes depending how you use it. It is recommended to use only distilled water to prevent mineral build up. It has a 16 ft heavy duty power cord. It has all the accessories that you could need which includes a handy extension hose, nozzle, angled nozzle, grout brush, color coded detail brushes, scraping tool, window squeegee, fabric steamer attachment, measuring cup and an instruction manual. The easy to press trigger is perfectly shaped to fit to your thumb so that you can easily control the flow of steam as you clean. If you hate having to wrestle with the packaging to get it out of the box when receiving a newly bought appliance you will love the Steam Shot since it is shipped in what is called Certified Frustration-Free Packaging. The brushes are color coded so that you can have a specific brush dedicated to only cleaning the bathroom and another brush dedicated to just cleaning the kitchen. The Steam Shot’s best feature (in my opinion) is how well it does getting into hard to reach nooks and crannies. It is great to clean the ‘seams’ between the stove top and counters tops or where the back splash and counter top meets. It is a whizz at defrosting anything in a very short time. It does really well as a clothing steamer when you use the fabric cover over the fabric steamer attachment. Many costumers reported positively on how well it does at taking wrinkles out of clothing. It doesn’t have an on/off switch. When it is plugged in it is on until it is unplugged. This is not a real problem because it is very easy to control via the steam button that is perfectly designed to control with one hand hand while wiping with the other hand. 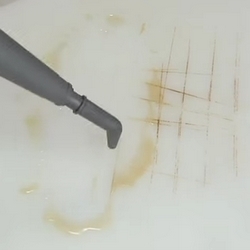 This is a light weight cleaner that is meant for tackling smaller cleaning tasks. If you keep your expectations realistic and use it as it meant to be it is a very handy little steamer. You need to use it in short bursts to prevent it from spitting water or running out of hot steam. I found that blasting an area with a short burst of steam before wiping the dirt away works best. While you are wiping gunk away the steam builds up pressure and it is good to go for the next blast of steam. There is no way to know how much water is left in the water tank at any time. Many customers expressed surprise at how much can be done with a single tank but it would be handy to know when you need to refill. To get the best of out of the Steam Shot use it in short bursts. Give whatever you are cleaning a good blast of steam and then wipe. While wiping the dirt away the steam will build up again and you will be able to continue steaming without having to wait. It is a fabulous clothing steamer but don’t use it without the cloth cover or else your clothing might get wet from the steam or droplets of water. Hold the Steam Shot upright without tilting it. Prepare to fall in love. 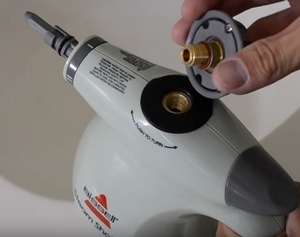 Several costumers reported that it is a perfect jewelry steam cleaner. Use jewelry tweezers or kitchen tongs to hold the jewelry piece and blast away. If you don’t mind using chemicals you can half the cleaning time and work by spraying your tiles with Clorox before going over it with the Steam Shot. You will literally be able to just wipe the dirt away.